This little hedgehog has now been returned to the wild. Every year we treat large numbers of wild animals brought in by the public or RSPCA. This year the dry weather has meant more dehydrated animals, particularly hedgehogs. We have also had lots of birds, especially young ones. The advice is generally that young birds, unless obviously injured, should be left where they are. Their mothers are often around or they are learning to fly. Over the years, along with the more common small birds and hedgehogs, we have also treated badgers, deer, weasels, foxes, swans, owls, birds of prey, ducks, bats, geese, rabbits, squirrels and probably many more that I can’t remember. This duckling had been attacked by a cat, sadly it died shortly after we admitted it. When a member of the public brings in injured wildlife the first thing we do is get vet to check it over. If we are not busy we can often do this whilst you wait. If we are busy then we will ask you to leave the animal with us and we will examine it when we have a gap. We always take the details of who has found the animal and where it was found. There are two reasons for this; one so we can release them where they are in familiar territory when they are recovered, and two, so we can keep you informed as to their progress! 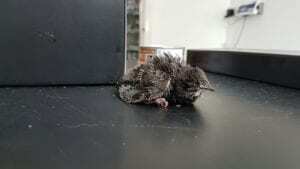 This baby swift (now christened Taylor) is currently doing well and being cared for by Matthew, our nurse. Obviously, there are cases where we consider it better for the animal to be put to sleep if its injuries are too severe or we cannot see a way it can be returned to the wild. 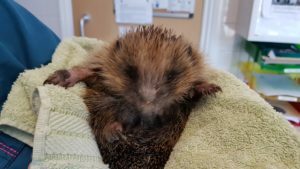 Several of our nurses have been on hedgehog care courses, we have small dedicated cages for hedgehog in-patients as well as separate accommodation for animals that might be alarmed by the proximity of cats and dogs. On top of all this we have contacts with local charities that will look after recuperating wild animals. As agreed between the RSPCA and the British Veterinary Association, we give emergency care for wild animals as a free of charge service.